On arrival in Montreal transfer to your hotel for a four-night stay. Montreal exudes excitement and joie de vivre, blending the old with the new. 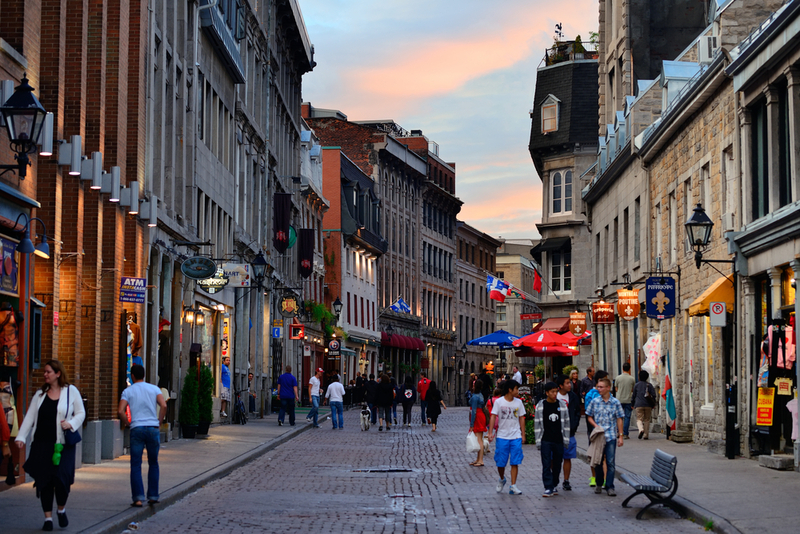 The skyscrapers that dominate the skyline reveal little of the quaint cobbled streets of Old Montréal or the art galleries, parks and churches found in every corner of the second largest French-speaking city in the world. ​Spend three full days experience the thrill and excitement of Formula One™ with premium grandstand tickets for practice, qualifying and the 2016 Canadian Grand Prix™. Today there is time for some last minute shopping or sightseeing before returning to Montreal Airport in preparation for your flight to Vancouver. Vancouver is set against a spectacular backdrop of natural wonders, providing a huge array of both indoor and outdoor activities for you to enjoy. You have three days to explore Vancouver’s many attractions including Stanley Park, a wilderness rainforest park right in downtown, Chinatown, Gastown and English Bay. A must-see is Grouse Mountain, rising 4,100ft and providing expansive views over Greater Vancouver, and with a variety of attractions at its summit. 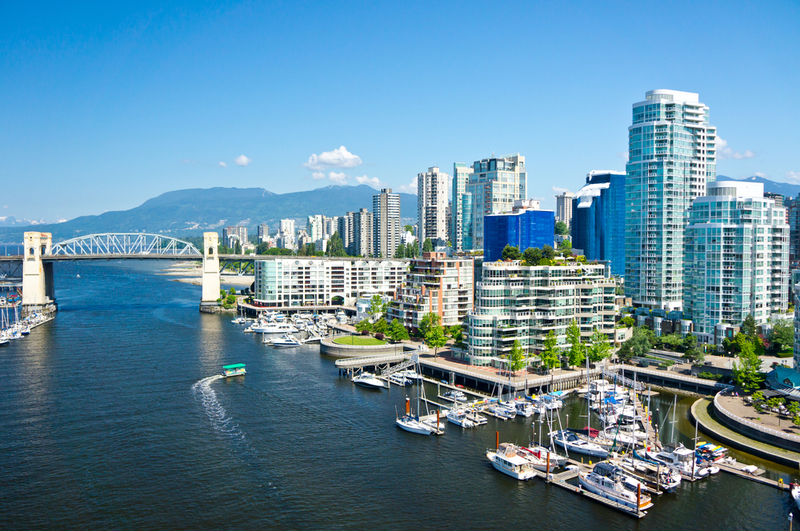 Shop, relax and explore Vancouver’s beautiful surroundings. Depart from Vancouver and journey towards Kamloops onboard the Rocky Mountaineer. Travel through the lush Fraser River Valley and in the shadows of the Coast and Cascade Mountains before encountering the steep cliffs and rapids at Hell’s Gate and on to Kamloops for an evening arrival. Your journey continues past ranchlands, rocky lakeshores, the Spiral Tunnels and Yoho National Park, before crossing over the Continental Divide into the beautiful mountain town of Banff. Your journey will end in your choice of Lake Louise or Banff. Canada’s oldest national park offers a world of activities and recreation in a mountain setting resplendent with awe-inspiring beauty. Make the most of your time in this mountain paradise and take the gondola to the top of Sulphur Mountain for the breathtaking views, cruise on nearby lake Minnewanka or visit the famous hot springs. There are lots of walking trails if you are feeling energetic and shops and bars if you’re not. 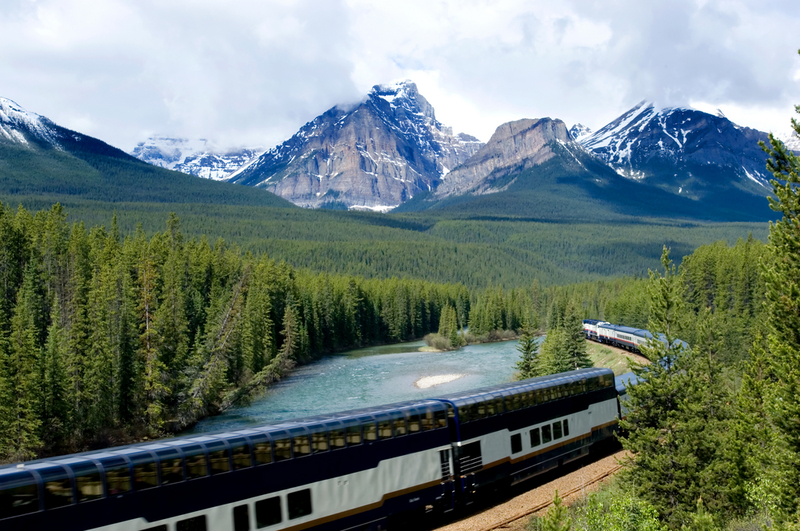 The Rocky Mountaineer is one of a kind and said by many to offer one of the most spectacular rail experiences in the world. 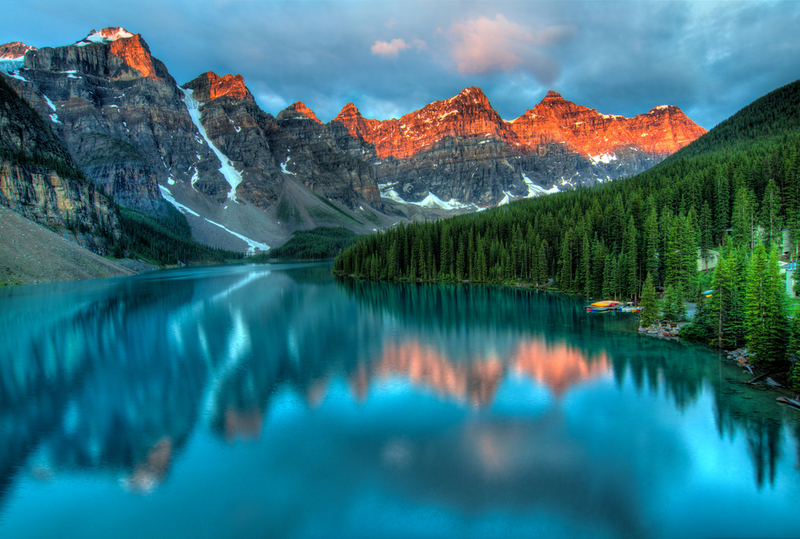 Cross the stunning scenery of the Canadian Rockies passing glistening snow-capped mountain peaks, sparkling glacial lakes, cascading waterfalls; pass by soaring forests and watch for bears and other wildlife as you travel in comfort and style in daylight hours. 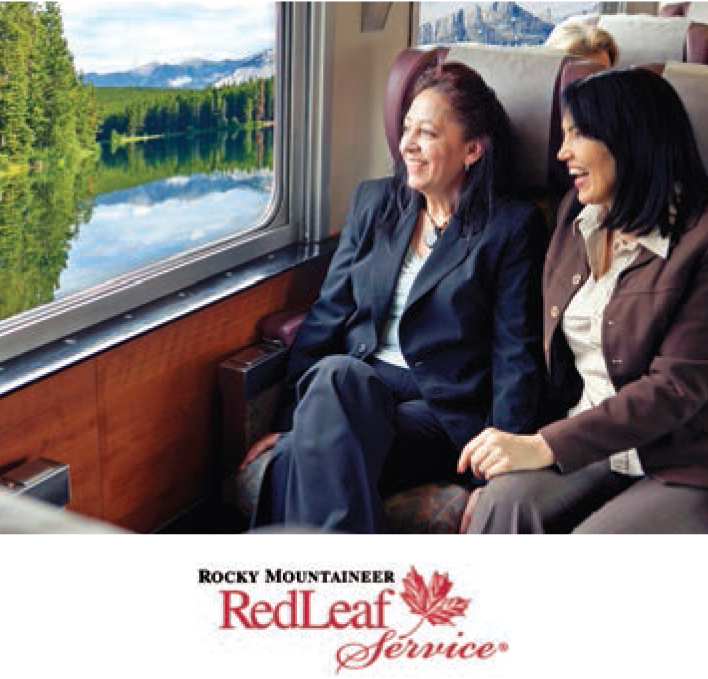 Relax in your reclining seat and enjoy commentary andimpeccable service provided by your Rocky Mountaineer Host. Scrumptious meals are served at your seat, so you won’t miss a moment of the breathtaking scenery. 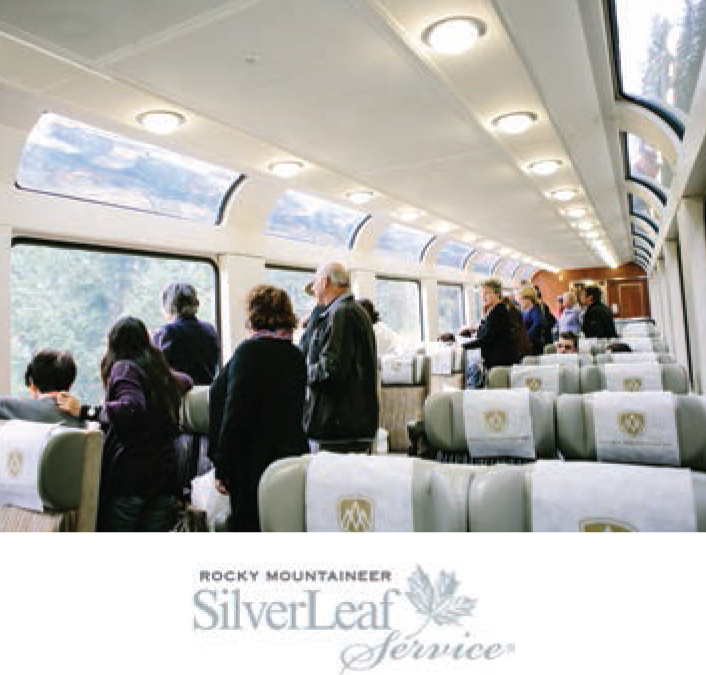 Discover SilverLeaf Service, a single-level glass domed coach offering awe-inspiring views of the majestic Canadian Rockies through oversized windows. 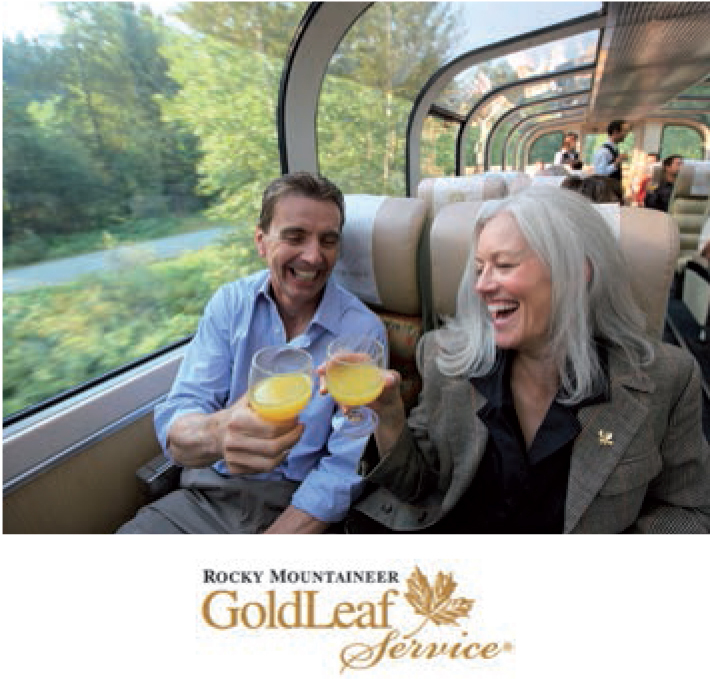 The luxury and comfort of Rocky Mountaineer’s award-winning GoldLeaf Service is simply beyond compare. Enjoy breathtaking views from your seat in the upper-level of the bi-level glass domed coach, and enjoy gourmet meals in the exclusive GoldLeaf Service dining room below.